KIR2DL4 (2DL4, CD158d), a member of the human killer cell Ig-like receptor (KIR) family, triggers potent IFN-γ responses but weak cytotoxicity in resting NK cells. 2DL4 mRNA has been detected in most NK cell clones from most humans examined, but surface protein expression is detectable only on CD56high NK cells from certain donors. The receptor possesses a transmembrane arginine residue, suggesting association with a signaling accessory protein that has remained elusive. We provide biochemical and functional evidence that FcεRI-γ (γ) associates with 2DL4 to promote surface expression and provide signal transducing function. Weak cytolytic responses triggered through 2DL4 may result from low stoichiometric association with γ. Selective association with γ distinguishes 2DL4 from all other activating forms of the KIR family, which alternatively associate with DNAX-activating protein (DAP)12. Most activating NK cell receptors noncovalently associate with homo- and heterodimers of four transmembrane (TM)3 accessory proteins: γ, TCRζ (ζ), DAP10, and DAP12, which may contribute distinct biological functions. These provide physical linkage with kinases through ITAM or YxxM motifs in their cytoplasmic domains (1, 2). For some activating receptors, the accessory proteins also support surface expression (e.g., γ and ζ for human CD16 (FcγRIII)) (3). Basic amino acids in the TM domains of most NK cell-activating receptors interact with acidic residues in the TM domains of accessory proteins. For example, the activating subgroup of killer cell Ig-like receptors (KIR) with short cytoplasmic domains (KIR2DS and KIR3DS) have a central TM lysine-mediating association with DAP12. KIR2DL4 (2DL4, CD158d) is a structurally and functionally unique KIR family member. Its engagement triggers potent IFN-γ production but only weak cytotoxicity in resting NK cells, although cytotoxicity is enhanced in IL-2-activated cells (4, 5). KIR2DL4 is a framework KIR gene (6) present in most individuals, and its mRNA is expressed in nearly all NK clones analyzed (7, 8). Surprisingly, however, 2DL4 surface expression is limited to CD56high NK cells (5, 9). Furthermore, up to 25% of humans are homozygous for a KIR2DL4 allele encoding a protein that is incapable of reaching the cell surface (2DL4.2, in contrast to the surface-expressed 2DL4.1) (5, 9, 10, 11). 2DL4 reportedly binds HLA-G (12, 13, 14), which is only expressed on trophoblast cells during pregnancy, although this ligand interaction has been disputed (15, 16). During pregnancy 2DL4 is expressed on most decidual/placental but not peripheral NK cells (13). IL-2 up-regulates 2DL4 surface expression in primary NK cells and the NK-92 cell line (5, 9) through a posttranslational mechanism that is independent of most of the cytoplasmic domain (5). Regulated surface expression, divergent structure, unique functional properties, and evolutionary conservation suggest distinct biological roles for 2DL4, possibly during pregnancy. 2DL4 has a TM arginine near the extracellular domain that is essential for activating function (17). It also has an ITIM, which can recruit the SHP-2 phosphatase to mediate negative signals in isolation (18), but does not appear to dampen the predominant activating function triggered in the context of the full receptor (5, 17). The identity of a putative 2DL4-associated TM accessory protein that transduces signals has remained elusive. Here, we demonstrate that γ can selectively associate with 2DL4 to support its function and promote its surface expression. NK-92, P815, NK3.3, Jurkat, and Phoenix-Ampho cells were cultured as described (5, 18). Sorted CD56+CD3− primary NK cells were cultured in RPMI 1640 with 5% autologous serum and 500 U/ml rIL-2 (Biological Resources Branch, National Cancer Institute, Frederick, MD). Volunteer blood donors were recruited by informed consent as approved by our Institutional Review Board. Labeled Abs were: PE-anti-CD69 (BD Pharmingen), PE-goat anti-mouse κ (Southern Biotechnology Associates), and HRP-anti-phosphotyrosine mAb (4G10, Upstate Biotechnology). Nonlabeled mAbs were: CD56 (B159.5), NKp44 (3.43.13), NKp46 (9E2) (18, 19), KIR3DL1 (DX9), LFA-1 (TS2/4.1.1), CD3ε (TR66), pan MHC class I (W6/32), ζ (H146–968), FLAG (M2; Sigma-Aldrich), and a bispecific anti-CD16 and -HER2/neu (2B1). Rabbit anti-γ sera were from Upstate Biotechnology and Exalpha. Rabbit Ab to DAP10 and DAP12 were from Santa Cruz Biotechnology. Goat anti-human IgG was from Southern Biotechnology Associates. An anti-2DL4 mAb (53.1; mouse IgG1) was kindly provided by M. Colonna and M. Cella (Washington University, St. Louis, MO). Specificity was confirmed by binding to FLAG-2DL4.1-transduced Jurkat cells and IL-2-activated NK cells from a 2DL4.1 homozygous, but not a 2DL4.2 homozygous, donor (not shown). Retroviral expression constructs for FLAG-2DL4.1, DAP12, DAP10, and γ in pBMN-IRES-EGFP (G. Nolan, Stanford University, Stanford, CA) or pBMN-NoGFP (18) and generation of stably-transduced NK cell lines were previously described (5, 18, 19). TCR-ζ was cloned into pBMN-IRES-EGFP using EcoRI/NotI sites. Transduced Jurkat cells (2 × 105/well) were seeded on mAb-coated 24-well plates (10 μg/ml 0.1 M sodium carbonate/bicarbonate buffer, pH 9.5, 500 μl/well; 3 h at 37°C) and incubated at 37°C for 18 h. Cells were harvested and stained with anti-CD69-PE or isotype-control mAb and analyzed on a FACScan. Cells were stimulated with pervanadate or not (18), lysed in 1% digitonin buffer (5) supplemented with Complete protease inhibitor (Roche; 1 tab/50 ml). Lysates were immunoprecipitated with mAb (2 μg on protein G-agarose). After washing, immunoprecipitates were separated on SDS-PAGE and immunoblotted as described (5). Redirected cytotoxicity assays used the FcγRII/III+ P815 murine mastocytoma cell line as targets in a 4 h 51Cr release assay (5). Cells (2 × 106/ml) loaded with 3 μM Indo-1 AM (Sigma-Aldrich) (20) were analyzed on a FACS VantageSE (BD Biosciences). After baseline was acquired, 3 μg of anti-FLAG mAb or control anti-LFA-1 mAb and 3 μg of goat anti-mouse IgG F(ab′)2 (Southern Biotechnology Associates) were sequentially added. Positive control Ab were anti-CD3ε or goat anti-human Ig. The 405/485 emission ratio was assessed over time using the FlowJo computer program (Tree Star). 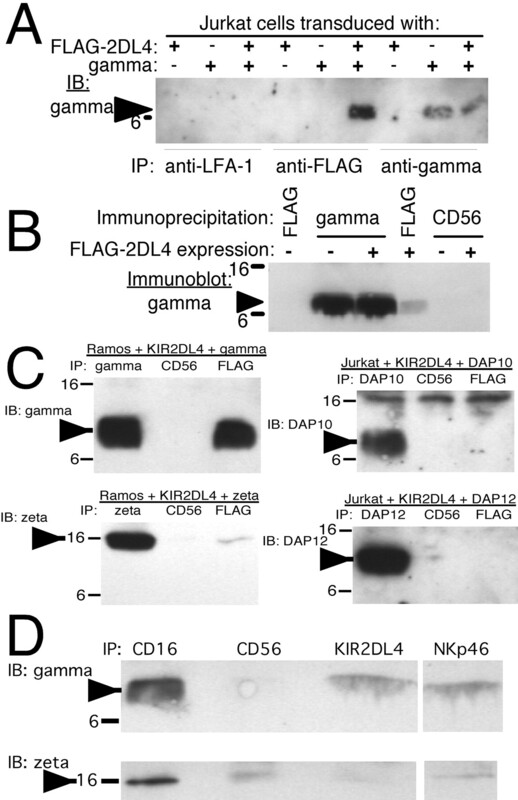 To determine whether 2DL4 associates with known NK cell transmembrane accessory proteins, Jurkat T cells were transduced with FLAG-tagged 2DL4.1 (5) ± γ, DAP10, or DAP12 (Fig. 1⇓A). Each population expressed only the corresponding transduced accessory protein, and all expressed ζ (immunoblots not shown). Engagement of 2DL4.1 with immobilized anti-FLAG mAb (18 h) increased CD69 levels slightly in cells expressing receptor alone or in combination with DAP10 or DAP12, but significant increases were detected only in cells expressing both 2DL4.1 and γ (see Fig. 1⇓A). No increase was detected in Jurkat cells expressing only γ (not shown), and anti-CD3 mAb induced CD69 expression in all cell populations. Coexpression of γ provides 2DL4 with activating function in Jurkat cells. A, Jurkat cells were sequentially transduced with retroviruses encoding γ, DAP10, or DAP12 (in pBMN-IRES-EGFP) and FLAG-2DL4.1 (pBMN-NoGFP). Cells expressing high levels of both EGFP and surface FLAG were sorted (left), stimulated with plate-bound Ab (18 h), and stained for CD69 (dark-lined histogram). Gray histograms represent background. Representative of at least two experiments for each population and stimulation condition. B, Intracellular Ca2+ concentration was monitored in Indo-1-loaded Jurkat cells after various stimuli: anti-FLAG (black line), anti-LFA-1 mAb (gray) both with anti-mouse IgG Ab cross-linker, or anti-CD3 mAb, as indicated. Representative of three experiments. Cross-linking 2DL4 with anti-FLAG mAb induced significant intracellular Ca2+ elevation in Jurkat cells expressing both 2DL4.1 and γ (Fig. 1⇑B), weak Ca2+ mobilization in cells transduced with 2DL4.1 alone, and no Ca2+ response in cells transduced with γ alone. No changes were detected upon treatment with control anti-LFA-1 mAbs. Thus, γ supports activating signals through 2DL4.1 in Jurkat cells. The weak 2DL4 signaling in Jurkat cells, which express only endogenous ζ, suggested that ζ might play a role in the 2DL4 receptor complex. Therefore, the B cell lymphoma Ramos (ζ-, γ-, DAP12-, and DAP10-deficient) was used to test whether ζ can contribute to 2DL4 function. As previously shown in diverse cell lines (4, 9, 14), 2DL4.1 was efficiently expressed on parental Ramos cells (Fig. 2⇓A). Cotransduction of γ using the bicistronic retroviral vector enhanced surface expression of the FLAG-tagged receptor in direct correlation with enhanced GFP (EGFP) expression (linear-oriented dot plot in Fig. 2⇓A). 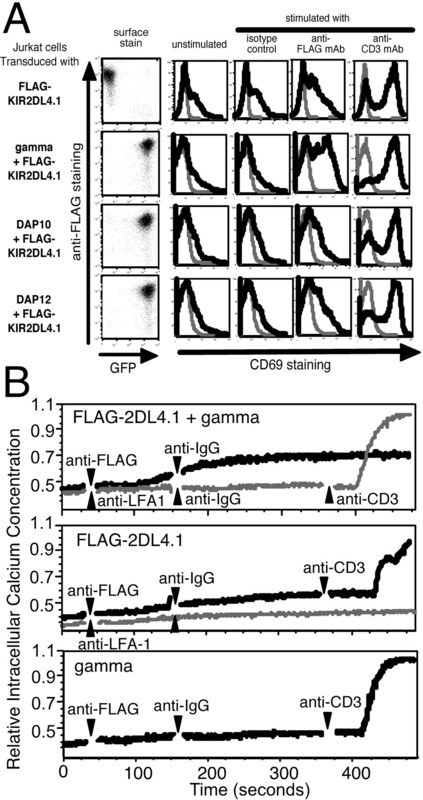 Despite high levels of ζ expression, however, ζ did not elevate FLAG-2DL4.1 expression in parallel with EGFP (Fig. 2⇓B). Thus, γ directly promotes 2DL4 surface expression, but ζ has little impact. 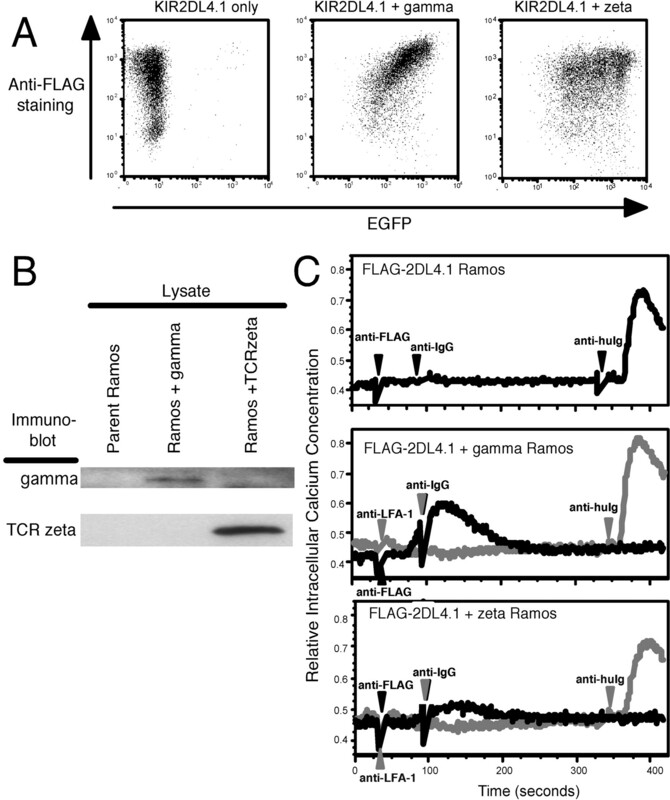 FcR γ promotes surface expression and function of 2DL4 better than TCR ζ in Ramos B cells. A, Ramos cells were sequentially transduced with γ or ζ (pBMN-IRES-EGFP) and/or FLAG-2DL4.1 (pBMN-NoGFP) and EGFP+/surface FLAG+ (M2 mAb) cells were sorted. Mean fluorescence intensities for FLAG-2DL4.1 stain: alone = 454, + γ = 1036, + ζ = 562. B, Cell lysates from each Ramos population (0.5 × 106/lane) were immunoblotted for γ and ζ proteins. C, Ca2+ mobilization was analyzed in transduced Ramos cells upon addition of anti-FLAG (black) or anti-LFA-1 mAb (gray) plus secondary anti-murine IgG (mIgG) and anti-human Ig (huIg) as in Fig. 1⇑. Representative of three experiments. Cross-linking with anti-FLAG mAb induced Ca2+ mobilization in Ramos cells cotransduced with FLAG-2DL4.1 and γ (Fig. 2⇑C). Alternatively, anti-FLAG cross-linking in cells transduced with FLAG-2DL4.1 alone had no detectable effect. Coexpression of ζ contributed only weak Ca2+ mobilization in response to anti-FLAG mAb (Fig. 2⇑C), similar to that in Jurkat cells expressing 2DL4.1 alone (Fig. 1⇑B). These results indicate that γ is the primary 2DL4-associated accessory protein, while ζ is substantially less efficient. The γ protein coimmunoprecipitated with FLAG-2DL4.1 from digitonin lysates of cotransduced Jurkat cells (Fig. 3⇓A), but was undetectable in control immunoprecipitates (Fig. 3⇓A). 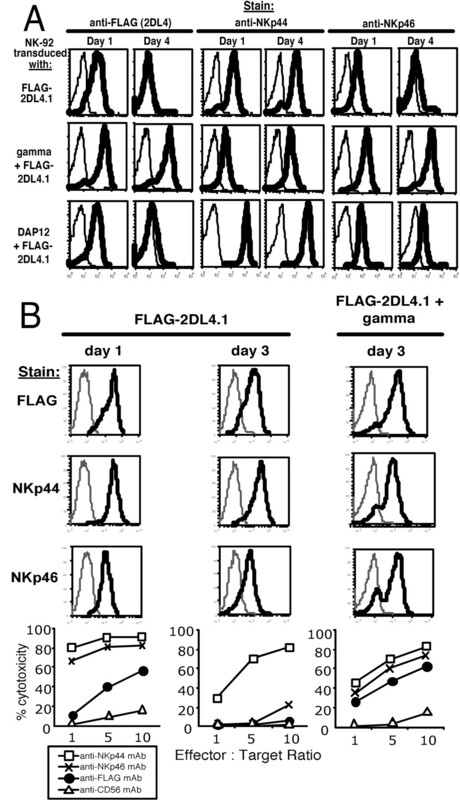 It was also detected in FLAG immunoprecipitates from FLAG-2DL4.1-transduced NK3.3 cells, which express high levels of endogenous γ (Fig. 3⇓B), but was not coimmunoprecipitated with CD56 or from NK3.3 parent cells using anti-FLAG mAb (Fig. 3⇓B). We could not detect ζ association with 2DL4 in these cells (not shown). In tests for coimmunoprecipitation of each TM accessory protein with 2DL4.1 from cotransduced cells, γ was strongly associated, ζ was only weakly associated, and DAP10 or DAP12 were not detected (Fig. 3⇓C). In IL-2-stimulated primary NK cells from a 2DL4.1 homozygous donor (5), γ was prominently associated with CD16, NKp46, and 2DL4, while ζ was associated with CD16 > NKp46 > 2DL4 (virtually absent in 2DL4 immunoprecipitates; Fig. 3⇓D). These results indicate that 2DL4 can physically associate with γ substantially more readily than with ζ, including in activated primary NK cells. Coimmunoprecipitation of γ with 2DL4. A, Digitonin lysates of Jurkat cells transduced with FLAG-2DL4.1 and/or γ were sequentially immunoprecipitated (IP) for LFA-1, FLAG, and γ. Samples were separated on 15% SDS-PAGE and immunoblotted (IB) with anti-γ Ab. B, Sequential immunoprecipitates of CD56, FLAG, and γ from digitonin lysates of NK3.3 cells (untransduced or transduced with FLAG-2DL4.1). C, Immunoblots of sequential CD56, FLAG, and accessory protein immunoprecipitations from cotransduced Ramos or Jurkat cells. D, Primary NK cells (50 × 106/sample) from 2DL4.1-homozygous donor 3D (5 ) were cultured in IL-2 for 18 days, lysed in digitonin, sequentially immunoprecipitated with mAb to CD16 (3×), CD56, and either 2DL4 or NKp46. Immunoblot conditions are indicated. After IL-2 stimulation of NK-92 cells, surface expression of 2DL4.1 peaks on days 1 and 2 and declines on days 3 and 4 (5). Coexpression of γ (but not DAP10 or DAP12) up-regulated FLAG-2DL4.1 surface expression in NK-92 cells, and expression was retained through day 4 after stimulation (Fig. 4⇓A and not shown). Interestingly, NKp46 was also up-regulated by IL-2 in NK-92 cells and upon transduction with γ (Fig. 4⇓A). NKp46 association with γ may explain its coordinate regulation with 2LD4. Alternatively, surface expression of NKp44, which associates with DAP12 (19), was nearly unchanged by γ transduction, but increased upon DAP12 transduction (Fig. 4⇓A). Retroviral expression of γ stabilizes surface expression of and promotes functions of 2DL4 and NKp46 in resting NK-92 cells. A, NK-92 cells transduced with FLAG-2DL4.1 (pBMN-NoGFP) ± γ or DAP12 (pBMN-IRES-EGFP) were stained for surface expression of FLAG, NKp44, or NKp46 either 1 (activated) or 4 days (resting) after IL-2 stimulation. Thick lines are Ab-stained; thin lines are background. Representative of at least two experiments. B, Transduced NK-92 cells were assayed 1 (activated) or 3 days (resting) after IL-2 stimulation, stained for receptor expression (dark histograms), and assayed for redirected cytotoxicity toward FcγR+ P815 target cells in combination with the indicated mAb (bottom). Representative of three experiments. Engagement of NKp44 triggered significantly stronger cytotoxicity than that of 2DL4.1 or NKp46 in resting NK-92 cells (5), whereas cytolytic responses were triggered through NKp46 or 2DL4.1 only in activated cells (Fig. 4⇑B). As predicted, γ cotransduction substantially enhanced NKp46- and 2DL4- but not NKp44-triggered cytotoxicity in resting NK-92 cells (Fig. 4⇑B). These results indicate that γ supports surface expression of and functional responses through 2DL4 in NK cells. We show that FcRγ can selectively associate with, enhance surface expression of, and promote functions of 2DL4. Our functional and biochemical evidence in all cell types tested suggests weak 2DL4 association with ζ, and indicates that γ is the primary associated accessory protein. Like 2DL4, most characterized immunoreceptors that interact with γ and ζ (Ig-like transcript (ILT)1, paired Ig-like receptors (PIR)-A, NKp46, and NKp30) possess a basic arginine residue near the extracellular side of their TM domain (21). Instead, DAP12-coupled receptors (KIR2DS/KIR3DS and NKp44) contain a lysine residue near the center of the TM domain (21). Thus, association of 2DL4 with γ is compatible with the configuration of its TM charge. We cannot rule out that 2DL4 also associates with an as yet unidentified NK cell TM accessory protein, but this seems unlikely, particularly in view of our coimmunoprecipitation of γ with 2DL4 from primary NK cells. Furthermore, inhibitors of Src (PP2) and Syk (piceatannol) family kinases abolish 2DL4-mediated IFN-γ production in NK-92 cells, which is consistent with signaling through an ITAM-containing TM accessory protein, such as γ (data not shown). Preferential γ association with 2DL4 is distinct from the less discriminatory association of γ or ζ with CD16 in human NK cells. Association with γ also distinguishes 2DL4 from the DAP12-associated activating KIR with short cytoplasmic domains (KIR2DS1–5 and KIR3DS1). The differences in cytolytic responses mediated through 2DL4 (and NKp46) vs NKp44 in resting NK-92 cells could be qualitative or quantitative. Qualitatively distinct signaling properties have been reported between γ, ζ, and DAP12. DAP12 and γ preferentially recruit Syk, while ζ more selectively recruits ZAP-70 (22, 23, 24). Also, the SH2 domain protein C (Shc) adaptor reportedly associates more with ζ than γ (25). Furthermore, the TCR complex in human effector CD4 T cells reportedly contains γ instead of ζ to mediate distinctive signaling through selective recruitment of Syk (24), and TCR containing γ instead of ζ were elevated in the hyperresponsive T cells of SLE patients (26). Our data showing that γ overexpression enhances 2DL4 (and NKp46)-mediated cytotoxicity, however, suggest that the unique responses cannot be entirely attributed to qualitatively distinct functions characteristically initiated through γ. Alternatively, if IL-2 stimulation induces more γ protein in NK cells or greater physical association of γ with 2DL4, a low stoichiometry of association with γ (or ζ) may provide a quantitative basis to explain the low surface expression and muted cytolytic responses by 2DL4 (and NKp46) in resting NK cells. A quantitative mechanism may be especially relevant to the function of 2DL4, which can reach the cell surface even without associated γ. Our data support the notion that the amount of available γ can positively influence expression and function of both 2DL4 and NKp46, and possibly other receptors. Further analysis of these and other possible mechanisms (e.g., differences in γ phosphorylation state or transport in resting vs activated NK cells) is warranted. We thank Drs. Dietmar Kappes, Bice Perussia, and Maureen Murphy for helpful comments and M. Cella, M. Colonna, L. Weiner, G. Nolan, and the National Cancer Institute Biological Resources Branch for reagents. ↵1 This work was supported by National Institutes of Health Grants CA83859 and CA100226 (to K.S.C. ), a Pennsylvania Tobacco Health Research Fund grant, and in part by National Institutes of Health Center of Research Excellence Grant CA06927 and an appropriation from the Commonwealth of Pennsylvania. ↵3 Abbreviations used in this paper: TM, transmembrane; DAP, DNAX-activating protein; KIR, killer cell Ig-like receptor; EGFP, enhanced GFP. Campbell, K. S., M. Colonna. 2001. Human natural killer cell receptors and signal transduction. Int. Rev. Immunol. 20:333. Lanier, L. L.. 2003. Natural killer cell receptor signaling. Curr. Opin. Immunol. 15:308. Lanier, L. L., G. Yu, J. H. Phillips. 1991. Analysis of FcγRIII (CD16) membrane expression and association with CD3ζ and FcεRI-γ by site-directed mutation. J. Immunol. 146:1571. Rajagopalan, S., J. Fu, E. O. Long. 2001. Cutting edge: induction of IFN-γ production but not cytotoxicity by the killer cell Ig-like receptor KIR2DL4 (CD158d) in resting NK cells. J. Immunol. 167:1877. Kikuchi-Maki, A., S. Yusa, T. L. Catina, K. S. Campbell. 2003. KIR2DL4 is an IL-2 regulated NK cell receptor that exhibits limited expression in humans but triggers strong IFN-γ production. J. Immunol. 171:3415. Trowsdale, J., R. Barten, A. Haude, C. A. Stewart, S. Beck, M. J. Wilson. 2001. The genomic context of natural killer receptor extended gene families. Immunol. Rev. 181:20. Valiante, N. M., M. Uhrberg, H. G. Shilling, K. Lienert-Weidenbach, K. L. Arnett, A. D‘Andrea, J. H. Phillips, L. L. Lanier, P. Parham. 1997. Functionally and structurally distinct NK cell receptor repertoires in the peripheral blood of two human donors. Immunity 7:739. Uhrberg, M., N. M. Valiante, B. P. Shum, H. G. Shilling, K. Lienert-Weidenbach, B. Corliss, D. Tyan, L. L. Lanier, P. Parham. 1997. Human diversity in killer cell inhibitory receptor genes. Immunity 7:753. Goodridge, J. P., C. S. Witt, F. T. Christiansen, H. S. Warren. 2003. KIR2DL4 (CD158d) genotype influences expression and function in NK cells. J. Immunol. 171:1768. Witt, C. S., A. Martin, F. T. Christiansen. 2000. Detection of KIR2DL4 alleles by sequencing and SSCP reveals a common allele with a shortened cytoplasmic tail. Tissue Antigens 56:248. Witt, C. S., J. M. Whiteway, H. S. Warren, A. Barden, M. Rogers, A. Martin, L. Beilin, F. T. Christiansen. 2002. Alleles of the KIR2DL4 receptor and their lack of association with pre-eclampsia. Eur. J. Immunol. 32:18. Rajagopalan, S., E. O. Long. 1999. A human histocompatibility leukocyte antigen (HLA)-G-specific receptor expressed on all natural killer cells. J. Exp. Med. 189:1093. Ponte, M., C. Cantoni, R. Biassoni, A. Tradori-Cappai, G. Bentivoglio, C. Vitale, S. Bertone, A. Moretta, L. Moretta, M. C. Mingari. 1999. Inhibitory receptors sensing HLA-G1 molecules in pregnancy: decidua-associated natural killer cells express LIR-1 and CD94/NKG2A and acquire p49, an HLA-G1-specific receptor. Proc. Natl. Acad. Sci. USA 96:5674. Cantoni, C., S. Verdiani, M. Falco, A. Pessino, M. Cilli, R. Conte, D. Pende, M. Ponte, M. S. Mikaelsson, L. Moretta, R. Biassoni. 1998. p49, a putative HLA class I-specific inhibitory NK receptor belonging to the immunoglobulin superfamily. Eur. J. Immunol. 28:1980. Boyson, J. E., R. Erskine, M. C. Whitman, M. Chiu, J. M. Lau, L. A. Koopman, M. M. Valter, P. Angelisova, V. Horejsi, J. L. Strominger. 2002. Disulfide bond-mediated dimerization of HLA-G on the cell surface. Proc. Natl. Acad. Sci. USA 99:16180. Allan, D. S., M. Colonna, L. L. Lanier, T. D. Churakova, J. S. Abrams, S. A. Ellis, A. J. McMichael, V. M. Braud. 1999. Tetrameric complexes of human histocompatibility leukocyte antigen (HLA)-G bind to peripheral blood myelomonocytic cells. J. Exp. Med. 189:1149. Faure, M., E. O. Long. 2002. KIR2DL4 (CD158d), an NK cell-activating receptor with inhibitory potential. J. Immunol. 168:6208. Yusa, S., T. L. Catina, K. S. Campbell. 2002. SHP-1- and phosphotyrosine-independent inhibitory signaling by a killer cell Ig-like receptor cytoplasmic domain in human NK cells. J. Immunol. 168:5047. Campbell, K. S., S. Yusa, A. Kikuchi-Maki, T. L. Catina. 2004. NKp44 triggers NK cell activation through DAP12 association that is not influenced by a putative cytoplasmic inhibitory sequence. J. Immunol. 172:899. Campbell, K. S., M. Cella, M. Carretero, M. Lopez-Botet, M. Colonna. 1998. Signaling through human killer cell activating receptors triggers tyrosine phosphorylation of an associated protein complex. Eur. J. Immunol. 28:599. Tomasello, E., C. Cant, H. J. Buhring, F. Vely, P. Andre, M. Seiffert, A. Ullrich, E. Vivier. 2000. Association of signal-regulatory proteins β with KARAP/DAP-12. Eur. J. Immunol. 30:2147. Taylor, N., T. Jahn, S. Smith, T. Lamkin, L. Uribe, Y. Liu, D. L. Durden, K. Weinberg. 1997. Differential activation of the tyrosine kinases ZAP-70 and Syk after FcγRI stimulation. Blood 89:388. McVicar, D. W., L. S. Taylor, P. Gosselin, J. Willette-Brown, A. I. Mikhael, R. L. Geahlen, M. C. Nakamura, P. Linnemeyer, W. E. Seaman, S. K. Anderson, et al 1998. DAP12-mediated signal transduction in natural killer cells: a dominant role for the Syk protein-tyrosine kinase. J. Biol. Chem. 273:32934. Krishnan, S., V. G. Warke, M. P. Nambiar, G. C. Tsokos, D. L. Farber. 2003. The FcRγ subunit and Syk kinase replace the CD3 ζ-chain and ZAP-70 kinase in the TCR signaling complex of human effector CD4 T cells. J. Immunol. 170:4189. Galandrini, R., G. Palmieri, R. Paolini, M. Piccoli, L. Frati, A. Santoni. 1997. Selective binding of shc-SH2 domain to tyrosine-phosphorylated ζ but not γ-chain upon CD16 ligation on human NK cells. J. Immunol. 159:3767. Nambiar, M. P., C. U. Fisher, A. Kumar, C. G. Tsokos, V. G. Warke, G. C. Tsokos. 2003. Forced expression of the Fc receptor γ-chain renders human T cells hyperresponsive to TCR/CD3 stimulation. J. Immunol. 170:2871.